This is the web page for Moss Creek at Grande Oaks. Below you’ll find news and manager updates, community documents and important property owner information. A community calendar is online as well. Please check back often. In the mean time, please be sure that your Association has your contact information by visiting this page Contact CMG Charleston and filling out the contact info form. Please also “Like” us on Facebook. There’s a link at the top of the page. Click here for information on handyman services! Pool keys – New home buyers are sent one key/access device by the Moss Creek POA. Resale pool keys and cards must convey at Closing. If any card is lost or stolen, a replacement is available for $10.00 payable to Moss Creek. Please follow this link to order a replacement amenity key. Please note that only 1 key is permitted to be activated per household. You will need Adobe Acrobat Reader available via this link. Spring arrived a bit sooner then expected…… March 04th, 2019: As Spring returns to the Lowcountry and brings us warmer weather, it also brings the growing season with pollen and those pesky weeds we see popping up at our driveways, sidewalks and lawns. Spring is also Mother Nature’s call to us to begin “Spring Cleaning” around our homes. This is a good time of year to begin buttoning up ... Read more about this. Moss Creek-amenity parking lot December 21st, 2018: The resealing and striping of the amenity parking lot has been rescheduled to begin Saturday, December 22, 2018 – weather permitting. It will be critical that owners do not park any vehicle(s) in this area to allow the crews full access to perform this work. Thank you. Read more about this. 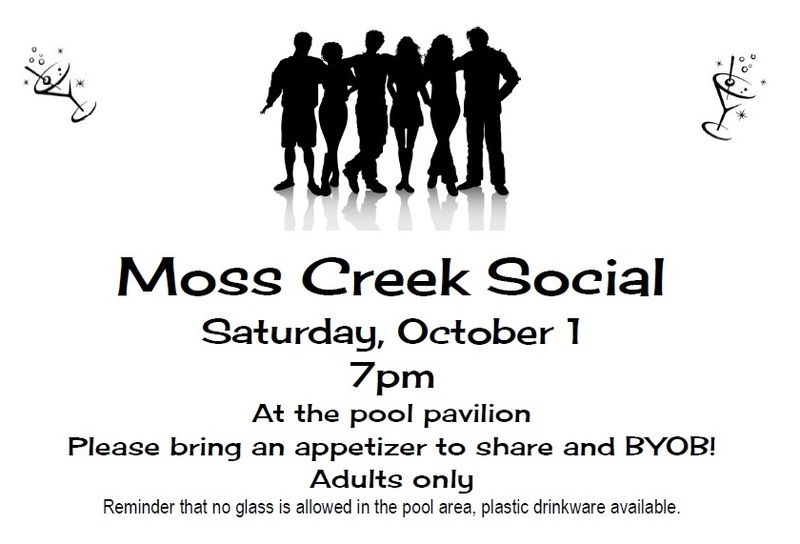 Moss Creek Annual Meeting November 09th, 2018: The Moss Creek POA Annual meeting will be held on Thursday, November 15th beginning at 6:30 PM. This important meeting will be held a the West Ashley High School where a sign in the lobby will direct owners to the appropriate class room. See you there! Read more about this. Pond Turnover October 25th, 2018: As we go into the fall months, we are in a time period where we will face fall turnovers in the pond waters. Turnovers occur naturally in the fall. The incremental drop in air temperature slowly decreases the surface water temperature, and the layers in the pond mix gradually. This gradual mixing rarely causes a ... Read more about this. Storm Clean Up October 12th, 2018: Hurricane Michael has left many areas with wind-blown debris in his wake. Please be aware the landscapers are aware of the needs and will be attending to the clean up when onsite performing routine maintenance. It may be as much as 7 to 10 days before everything is tidy and back to normal. Thank you ... Read more about this. Pool Closing Date September 28th, 2018: The Moss Creek Pool will close this Sunday, September 30th. The Association hopes you have enjoyed the 2018 Pool Season! Read more about this. Phone numbers to know if a hurricane strikes September 10th, 2018: Add these numbers to your phone contacts because they may come in handy if a hurricane drenches the Lowcountry. The S.C. Emergency Management Department recommends fully charging your cell phone and other mobile devices before the hurricane approaches and to limit non-essential calls. And remember, call 911 only for real emergencies. County Resources: Berkeley County Citizen’s Information ... Read more about this. Pet responsibilities August 17th, 2018: A few reminders of pet owner responsibilities: • Pets need be leashed and under control at all times. This includes cats who should never be allowed to wander. • Please be a courteous neighbor and pick up after your pets, be respectful and clean up all areas including sidewalks/walkways, vacant lots, common areas and individuals property. Dog ... Read more about this. Back to School Safety August 15th, 2018: With school beginning for most Districts next week, below are a few reminders from the National Safety Council: School days bring congestion: Yellow school buses are picking up their charges, kids on bikes are hurrying to get to school before the bell rings, harried parents are trying to drop their kids off before work. It’s never more ... Read more about this. It’s the Battle of Rain vs Mowing August 03rd, 2018: With all the rain the LowCountry has experienced in the past couple of weeks, the rain is winning the battle with mowing of the turf. The Association would rather see taller than normal grass which can be resolved once things dry vs ruts in the turf caused by the mowers which can take many weeks ... Read more about this. Pet leash reminder July 19th, 2018: As a reminder, when out walking with your pet, City Ordinance requires pets be on a leash at all times. Please be a responsible pet owner by abiding by the leash law as well as picking up all deposits left by your pet. Thank you. Read more about this. What everyone should know about Storm Water Ponds April 05th, 2018: Storm water ponds are extremely important components of your community’s drainage system. They are designed to provide two critical services: -prevent flooding by suppressing surges of storm water runoff that wash from lawns, buildings, and paved surfaces. -protect water quality by holding water long enough for natural processes to remove sediment and some pollutants from the water ... Read more about this. Pool Openings April 03rd, 2018: Your Association pool is OPEN! and despite the not so warm temperatures, many families have taken advantage of the opportunity to begin their swimming season. A couple of quick reminders are noted below. Please assist the Association in insuring a GREAT pool season for all. Thank you! There is an emergency phone inside the pool gate Never swim ... Read more about this. Spring Landscape Tips March 05th, 2018: Below are some great landscaping tips from Yellowstone Landscaping for the month of March! tStep 1: Enjoy this beautiful weather! The official start of spring is in sight – March 20! Now is a great time to get out and about and enjoy the beautiful weather and crisp, blue skies while taking a few simple steps to ... Read more about this. Frozen Pipe Tips January 02nd, 2018: With the current cold snap and several nights with below freezing temperatures – here are a few good reminders: How to Deal with Frozen Pipes Disconnect and drain garden hoses. Cover outside faucets with insulating foam covers. Turn off water to outside faucets, if available, and open valves on faucets to allow them to drain. Turn off sprinkler system and ... Read more about this. Please note that some documents were downloaded from the County and were current as of the date they were downloaded. They have been scanned via Optical Character Recognition. They are not certified as complete, and they and ARE NOT THE ORIGINAL DOCUMENTS. Please consult your closing attorney or the County directly for the most current, accurate complete and legal information. We’d love to know what’s on your mind.